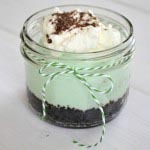 These No Bake Mini Grasshopper Pies are a delicious and easy to make dessert! They’re both minty and chocolatey! In a saucepan, melt the marshmallows with the milk over low heat. Then chill the mixture, stirring it occasionally, until mixture begins to set. Once the marshmallow mix has cooled and set, stir in the Creme de Menthe. Set aside. Using a mixer, whip the whipping cream until soft peaks form. Then fold the whipped cream into the mint mixture. Set aside. Now it’s time to put the pies together! For the crust, evenly spread the cookie mixture into the bottoms of your mason jars, then pack it down. Add the mint mixture on top of the cookie mixture, evenly spreading it out between the 5 jars. If you like, top the mini pies with a little dollop of whip cream, and some chocolate shavings. I just grated some semi-sweet chocolate, and sprinkled it on. If you don’t want to use Creme de Menthe, you can substitute it with 1 tsp of mint extract and a couple drops of green food colouring. Or use mint cookies.